We asked eleven landscape professionals, all at different stages in their careers, to tell us what inspired them to follow a career in landscape and what advice they would give to others. Their answers show the breadth of talent, experience and passion across the profession. They explain how they trained, what is important to them about the profession and how they would recommend it to others. Liz is in the second year of the MLA Landscape Architecture (conversion route), at The University of Greenwich. What inspired you to study to become a landscape professional? A desire to pursue a career that combined my interest in art and design with an increasing consciousness about the environment. I came to this profession late, having studied as an undergraduate in advertising and marketing communications. I worked in the digital media industry for more than 10 years. I hadn’t been aware of landscape architecture previously. When I found the www.bealandscapearchitect.com website, through exploring town planning courses, I realised I had found the perfect fit for me. How did you train, what sort of work experience did you have? I am training now and had no prior experience – which definitely feels very overwhelming at times! Media agencies are structured almost identically to landscape practices, so that is relatable from a business perspective. I am a trustee for Parks for London, an independent charity, and last summer I worked for a garden design company to gain some planting experience. What trends do you predict for your industry within the next few years? The industry is set to become more inclusive with a focus on collaboration of specialists versus isolation of professional titles. This is a welcome approach to a newcomer like myself who has a non-traditional background. I am interested to see the evolving role landscape professionals play in responding to the challenge of water management in the present and future climate. I also believe the profile of the industry will only go from strength to strength, as parallel topics related to the environment – like the use of plastics and our oceans – gain mainstream news headlines. Why is the landscape profession important to the future of society and the environment? It comprises a variety of very talented and passionate individuals that, as a collective, have the power to instigate debate, decisions and action on behalf of or by society. My observation would be that people are particularly committed to their work and trust that they can make a positive difference to the status quo. What would you tell someone who is thinking about becoming a landscape professional? Great decision! I wasn’t proactive enough in my own background research. I would advise speaking to someone who works in the profession to find out more about their role. If you are planning to study, cross check the expectations of the industry with the course syllabus. Also start growing things! Veggies, bulbs, herbs, anything. For me the landscape profession is an interesting balance of art and science, with an underlying practical intention. There are a lot of highly inspiring projects at an international and national level. With a multitude of aspects to learn inevitably I assume there is a niche for many people, as well as a generalist role you can pursue. I love it because it is impossible not to care. Start growing things! Veggies, bulbs, herbs, anything! Choosing a job is one of the hardest decisions you have to make. Finding one you love is even harder. 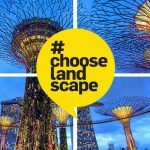 #ChooseLandscape is helping the landscape professionals of tomorrow make the right choice today.